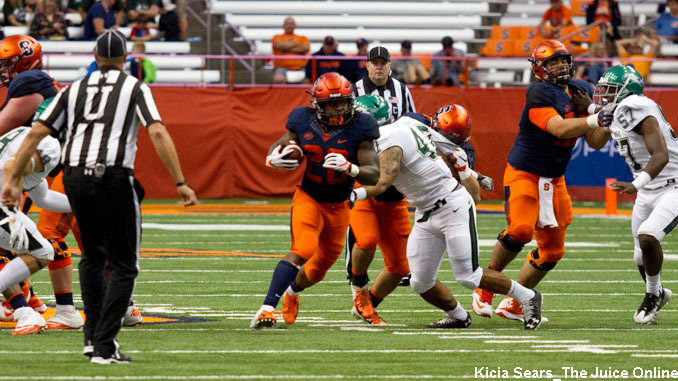 Syracuse freshman running back Jarveon Howard carries the ball down field against Wagner. Mandatory Photo Credit: Kicia Sears, The Juice Online. Syracuse is 4-1 and will try to enter the top 25 for the first time since 2001 when it heads to Heinz Field to play Pitt. Ahead of the game, The Juice Online’s Brad Bierman and Wes Cheng gave their predictions for the game. BRAD BIERMAN (Season Predictions, 4-1): It’s Retro Weekend at Pittsburgh, with four of the scheduled men’s and women’s sports programs, including the football team at Heinz Field, donning the old royal blue and mustard colors worn by Pitt football between 1973 and 1996. Think of the Tony Dorsett, Dan Marino and Curtis Martin teams, going up against the likes of Bill Hurley, Don McPherson and Donovan McNabb. Fast forward to this year’s Panthers team wearing those colors, or particularly the Pittsburgh (2-3, 1-1) defense which was decimated last week by Central Florida quarterback McKenzie Milton, an understated Heisman Trophy candidate for a team with a 17 game winning streak, to the tune of 328 passing yards and four touchdown passes. The Pitt offense never established a rushing attack against UCF, stymieing sophomore quarterback Kenny Pickett’s ability to get anything going in the passing game (163 yards, one TD, one interception). With that Panther preview in mind where does that leave Syracuse (4-1, 1-1) this first week of October preparing for an annual foe at a location it has only one once (2001), coming off its first loss of the season, surprising practically all but those inside the football wing at Manley? For one, a victory puts SU one win from bowl eligibility heading into a much appreciated open date the following weekend. While Eric Dungey wouldn’t mind duplicating the point total and passing statistics that his former backup Zack Mahoney (43 of 61 passing for 440 yards and five touchdowns) crazily produced two years ago on the same field in that 76-61 video game back-and-forth Pitt win, the ‘Cuse defense will be a tad more stingy than last year’s unit that gave up 24 points in SU’s 27-24 Dome victory. The Orange will make it two straight over Pittsburgh and go to 5-1 – Syracuse 32, Pittsburgh 18. WES CHENG (Season Predictions, 4-1): The last time Syracuse was ranked in the top 25 (2001) was also the last time they won at Heinz Field. That losing streak has spanned a long period of time for a few reasons. First, of course, has simply been the talent level on the field. The Greg Robinson era set Syracuse back many years while Pitt became one of the better teams in college football under Dave Wannstedt. Even as SU became relevant again under Doug Marrone, games on the road against Pitt generally came later in the year, as Syracuse.com’s Brent Axe noted on Twitter. This means worse weather and, as we all know, in recent history, the Orange team that starts the season is rarely the one that finishes (case in point: Eric Dungey). So an early October matchup definitely helps the Orange in terms of those factors. And of course, Syracuse appears to be the more talented team this year. The Panthers were throttled by No. 13 UCF last week, 45-14, on the heels of a disappointing 38-35 loss to North Carolina, which is in a down year. Offensively, the Panthers are struggling to throw the ball, averaging just 151.6 yards through the air (119th in the FBS) while their defense is allowing 32.0 points per game (97th). Perhaps even more frustrating is the lack of discipline. The Panthers all too frequently have been their own worst enemy, getting flagged for 76 yards per game (112th). It is for all of those reasons that the Orange enter as a four point favorite. Prior to the season, I predicted a 31-28 Syracuse victory, and I’m not going to stray from that.